The Adidas Originals NMD_R1 is available at a reasonable price. The majority of the users described this pair as comfortable. A handful of users praised the stylish and cutting edge design of the Adidas NMD_R1. Many wearers enjoyed the lightness of this pair. Few users shared that this pair has the right amount of toe space. Many sneaker fans admire the nice colorways present in the market. Many users liked the tongueless design of this pair. Several wearers mentioned that they liked the easy to slip-on design of this footwear reinforced with laces to keep their feet secured at all times. This pair is very versatile, said many users. It is suitable to be worn from light training to street walking. Most of the buyers disclosed that they would recommend the NMD_R1 to their friends. The Adidas NMD_R1 runs big. Many users recommend grabbing a half size smaller than usual. Adidas has hit the home run once again with the NMD_R1. This breakthrough style showcases the Boost cushioning for limitless energy return. This insanely stylish and comfortable pair lies on the thin line that separates the throwback feel and the cutting edge style. The space-aged sneaker will definitely keep its wearer’s head in the game. Whether a sneakerhead or not, this NMD_R1 is absolutely worth a piece of space in anyone’s closets. Nic Galway, one of Adidas’ veteran designers, conceptualized footwear that can be worn not for any specific sport, but just for the daily wear on the streets. He wanted to create a shoe that is discernable even from afar with its unique profile. Galway unearthed some designs from Adidas’ archive and incorporated simplicity and functionality into it. The NMD was heavily inspired from the retro sneakers such as the Micro Pacer, Rising Star, and the Boston Super. In 2015, they launched the NMD, which in turn became a sensational Adidas line. NMD stands for Nomad, a member of a community who constantly moves from one place to another. That is basically the vision of Galway, for his shoe to be worn by people who are in constant travel. He wanted his shoe to fit the nomadic lifestyle, which is a life without boundaries. He thought of creating footwear that people can bring anywhere and do anything without the feeling of lugging something along. The lightness and the comfort that the NMD deliver makes it one of the sought-after pairs in today’s generation. Many people resell their NMDs in as high as $1000 US. To date, the market sales of the NMD sneakers are not slowing down, and Adidas keeps on introducing newer versions every season. Adidas released the NMD_R1, also known as Adidas NMD Runner, as their first model under the NMD line. The design was inspired by several running shoes and tweaked them to fit the urban lifestyle. The Boost sole technology was used for an ultimate comfortable underfoot experience. The Boost cushioning also provides endless energy return with every stride. The upper of the NMD_R1 is exceptionally soft which embraces the foot entirely and snugly for total comfort. Although patterned from a running shoe, the Adidas Originals NMD_R1 is not suitable for long-distance running and was specifically designed for urban cruising. The NMD_R1 will always be outstanding in comfort but not in the performance. Released exclusively in Japan, this NMD version displays hints of Japanese touches, such as minimalist look with Japanese characters on its midsole plug. This model was launched in versions - the Adidas NMD_R1 Triple Black and the Adidas NMD_R1 Triple White. This sleeker and more streamlined version of the Adidas NMD_R1 features the advanced knit tech called Primeknit boosting this iteration's overall comfort level and style. Despite the slightly pricey range of this NMD_R1 PK model, many still recommended this for its durability, comfort, and chicness. Introduced in 2017, this low-top Adidas NMD sneaker displayed most of the details of its ancestor but designed to be more friendly to wearers who are always on-the-go. The sock-like construction of the Primeknit upper hugs the feet comfortably added with ultra bouncy and responsive Boost midsole. After the Adidas Stan Smith and Adidas Superstar, Japanese brand Bedwin and the Heartbreakers collaborated with Three Stripes to come up with their version of the Adidas NMD_R1 in grey. This sneaker displays a pinstriped grey upper added with unique stitching on the 3-Stripe logo. Meanwhile, the brand name is printed on its white heel pull tab to add character. This partnership launched a version of the Adidas NMD_R1 exclusive for the women. It has a low-top profile with the mesh upper added with signature Gucci colors and the double G branding. Unlike the other Gucci kicks, this shoe is relatively affordable yet stylish as compared to the other luxurious Gucci kicks. Adding another pair to their roster of sneakers born from their partnership with Adidas, atmos and Adidas launched the Adidas NMD_R1 in black and white. The predominantly black mesh upper is added with white 3-Stripe seated on top of the white Boost midsole. Adding to the style is the Adidas typescript on the upper with few printed words about Adidas in different languages. When the NMD_R1 was first released in the retail, it was being advertised as the shoe for the urban Nomads. The modern style of NMD_R1 is fit for the people who cruise around the cities that need better cushioning and support and at the same time being stylish. The stability plugs found in the midsole are the refreshing addition to the white Boost. This element serves as a support to the Boost midsole to increase the level of comfort for the all-day use. Many users like the versatility of the NMD_R1 which makes this a suitable sneaker from running errands to light training. They can practically pair this with any outfit, be it old worn-out jeans or skinny track pants or just any casual pair of shorts. This Adidas NMD for women R1 displays a combination of pink and core black on its knit upper added with cloud white Boost midsole. Another women-exclusive Adidas NMD R1, this time it is made of maroon knit upper with light pink midsole plug and heel pull tab on top of a white Boost midsole. This monochromatic green upper is contrasted with ice purple on the iconic 3-Stripe logo and Adidas branding on the tongue. This colorway was introduced in 2016. These women's Adidas NMD_R1 casual shoes exhibits tonal raw pink on its knit upper on top of white Boost outsole. Also known as the Triple Red, the all-red look of this sneaker gives a two-toned, bright red effect on its upper resting on top of the red Boost midsole. This pair was introduced in 2017. It exhibits a knit upper printed with a Glitch pattern with white 3-Stripes branding and Boost midsole. The stretchy mesh upper of this unisex sneaker is dipped in black hue added with carbon grey midsole plug and white Boost cushioning. Wholly offered for the ladies, this sneaker is covered with a stretchy mesh upper in pink finished off with a bouncy white Boost midsole and black outsole that is accented with light grey midsole plug. This colorway bears resemblance to the Vapour Grey NMD_R1 and displays a full beige mesh upper added with dark tan 3-Stripe logo on the side and the white Boost midsole. The two-toned black mesh upper with black overlays, laces, and rubber outsole give stylish flair while the white Boost midsole adds contrast. The cloud white stretchy mesh upper and white Boost midsole give clean and crisp appeal while the light grey midsole plug and the black rubber outsole adds contrasting design to the all-white upper. The upper of the NMD_R1 Adidas is made of stretch mesh that is super flexible and perfectly molds to the entire foot that provides maximum support and comfort to the wearers. The lace-up closure, meanwhile, offers a snug fit that is looped on the TPU eyelets which also functions as a support for a secure fit. It has the iconic NMD heel pull tab to aid the wearers in putting on this pair. In addition, the collar has no significant amount of cushioning to retain the slim profile of this Adidas Originals pair. The sole is made of Boost technology that gives a comfortable and ultra-responsive cushioning. The Adidas NMD_R1 is offered in men's and women's sizing and generally runs true to size. 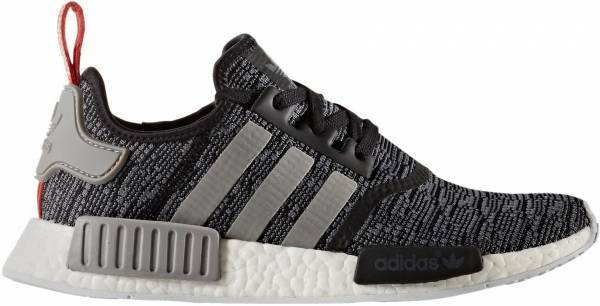 Men can choose from sizes 4 to 14 while the Adidas Originals NMD_R1 women’s shoes are available from sizes 5 to 11 US in medium width. One iconic feature of the Adidas NMD _R1 casual shoes are the lego-like blocks found in the Boost midsole. Adidas calls this the stability plugs which provide support in the Boost foam. The EVA stability plug that is found on the rear is a tad bigger than the one found on the front area. This striking feature adds aesthetic value to the entirety of the NMD_R1. Another striking feature is the pull-loop found on the heel which was supported by the rubber heel counter. The pull loop has “The brand with the Three Stripes” printed on it. This feature became one of the iconic features of the NMD line. The rubber outsole of the Adidas NMD_R1 sneaker has numerous holes which allow the Boost to move freely for the best energy return. The rubber outsole provides plenty of grippy traction with each step. The heel counter is sometimes called the “heel mustache.” It is an iconic feature that works as reinforcement to the heel tab. The NMD_R1 sits atop the revolutionary Boost technology which is said to be the most responsive cushioning of Adidas. It provides an unlimited supply of speedy energy. The molded EVA stability plugs found on the midsole give the NMD line its distinguishing feature. It has a reflective 3-Stripe on the side and the tongue tab. The Adidas branding can be found in various areas. They are on the tongue, on the rubber heel counter, on the rubber outsole, and the front stability plug.